Who's Coming to The American Business Awards on Friday? The second part of The 12th Annual American Business Awards, the premier business awards program in the U.S.A., will take place this Friday evening in San Francisco. Tickets are still on sale. A few years ago the ABAs were split into two ceremonies. The first ceremony this year took place on June 13 in Chicago, where Gold, Silver and Bronze Stevie® Awards were conferred in categories for human resources awards, customer service awards, most of the marketing awards, PR awards, video awards, live event awards, publication awards, and many of the management awards and company awards categories. This Friday evening, September 12 at the Palace Hotel in San Francisco, we'll present Stevies in the categories for websites, apps, IT, new products and services, and for management and organizational excellence in all technology-related industries. We're expecting more than 250 executives from nominated executives to attend. Get a PDF of the awards banquet program book here. The results will be published at www.StevieAwards.com/ABA late Friday night. The ceremony will be taped for broadcast by the BizTalkRadio network on the following Friday, the 19th, at 8:00 pm ET. So who's coming this to this Friday's awards gala? Here's the confirmed list as of this moment. Questions about the ABAs? Don't hesitate to contact us. The 2015 American Business Awards will open for entries in October. Get the entry kit!Get the entry kit! We've just published a 5-minute video about how to enter the U.S.A.’s top business awards program, The American Business Awards. Our brief video covers all of the information you'll need to be able to prepare and submit entries to the ABAs. All individuals and organizations within the U.S.A. -- public and private, for-profit and non-profit, large and small -- may submit nominations to the ABAs. The American Business Awards recognize achievement in every facet of the workplace. Our business award categories include: annual report awards, app awards, company/organization awards, customer service awards, human resources awards, information technology awards, management awards, marketing awards, new product awards, public relations awards, support awards, and website awards, among others. See all corporate awards categories. The entry deadline for the 12th edition of The American Business Awards is March 26. Late entries will be accepted through April 23 with payments of a late fee. Nominations should cite achievements since January 1 2013. There is no eligibility timeframe for web site and app entries - it does not matter when they were first published. Get your entry kit for the ABAs – it contains everything you’ll need to know about how to prepare and submit entries. Questions about how to select categories or submit entries? Contact us at help@stevieawards.com, +1 703-547-8389. 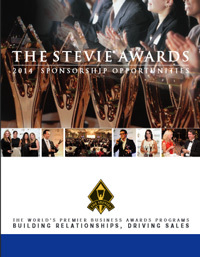 The Stevie Awards, the world's premier business awards programs, have just published a brochure about our 2014 sponsorship opportunities. The brochure outlines the opportunities associated with our six awards programs in 2014, including two new programs - the Asia-Pacific Stevie Awards and the forthcoming German Stevie Awards. We welcome the opportunity to customize sponsorship benefits to suit your needs. Contact Stevie Awards president Michael Gallagher for details. The Stevie® Awards held one of its awards galas for its 11th annual American Business Awards competition last night, and announced the winners of its first-ever Grand Stevie Award trophies. LifeLock received the Grand Stevie for organization of the year, for earning the most award points in The 2013 American Business Awards. Other top ABA Grand Stevie winners include Makovsky for interactive services agency of the year, Slack and Company for marketing agency of the year, and MWW for public relations agency of the year. The Grand Stevie Awards were presented to the organizations that submitted the best body of entries to The American Business Awards this year, in their own name or in the names of one or more clients. The organizations with the most points won, with a Gold Stevie Award win counting for three points, a Silver Stevie win for two points, and a Bronze Stevie win for 1.5 points. Last night’s gala, focused on new product awards, website awards, and other tech awards, was the second of two American Business Awards ceremonies this year. The first ceremony took place in Chicago on June 17 and honored winners in disciplines such as customer service, human resources, corporate communications, live events, publications, and selected categories for company/organization, management and marketing. More than 250 executives attended last night’s awards banquet at San Francisco’s Julia Morgan Ballroom. Stevie Awards were conferred in three levels of distinction: Gold, Silver and Bronze. 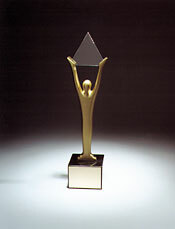 For a complete list of all 2013 American Business Awards’ Stevie Award winners visit http://www.StevieAwards.com/ABA. More than 3,200 entries were submitted to The 2012 American Business Awards and more than 320 executives nationwide participated in judging to determine this year’s Gold, Silver and Bronze Stevie Award winners. Entries for The 2014 American Business Awards will be accepted starting in October. Stevie Awards are conferred in four programs: The American Business Awards, The International Business Awards, the Stevie Awards for Women in Business, and the Stevie Awards for Sales & Customer Service. A fifth program, the Asia-Pacific Stevie Awards, will debut later this month. Honoring organizations of all types and sizes and the people behind them, the Stevies recognize outstanding performances in the workplace worldwide. Learn more about the Stevie Awards at http://www.StevieAwards.com and follow the Stevie Awards on Facebook, LinkedIn, Twitter, and YouTube. The 11th Annual American Business Awards announced Stevie® Award winners last night at its event focused on outstanding new products and services and on achievements in technology industries. Last night’s gala was the second of two American Business Awards ceremonies this year. The first ceremony took place in Chicago on June 17 and honored winners in disciplines such as customer service, human resources, corporate communications, live events, publications, and selected categories for company/organization, management and marketing. Winners in all new product and technology-related categories were announced at the event in San Francisco last night. Also announced last night were the first-ever Grand Stevie Award winners. The Grand Stevies were awarded to the organizations who received the most awards overall – Gold, Silver or Bronze – in the ABAs this year. 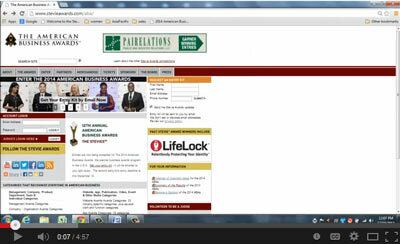 LifeLock was presented with the Grand Stevie for Organization of the Year. The winners of the other Grand Stevie Awards will be named in a followup press release today. AT&T, Inc., Dropbox and Marvell were the top winners of Gold Stevie Awards last night with three each. Winners of two Gold Stevies include Actiontec Electronics, Brainshark, Inc., DRC, ExtraHop Networks, LexisNexis, Web Advanced, Wilshire Axon, and ZehnerGroup. For a complete list of The 2013 American Business Awards winners announced last night visit http://www.StevieAwards.com/ABA. Winners of the People’s Choice Stevie Awards for Favorite New Products, which were determined by more than 20,000 votes in July and August, were announced in August and presented their crystal People’s Choice Stevie Awards last night. Today, Friday, August 9, is the last day to vote in the 5th edition of the People's Choice Stevie® Awards for Favorite New Products, as part of The American Business Awards, the nation’s premier business awards program. Voting is open at http://peopleschoice.stevieawards.com and will conclude at 11:59PM ET tonight. All new products and services that were nominated in the new product awards categories of The 2013 American Business Awards are automatically included in people’s choice voting. Organizations will have the opportunity to win two awards: a Gold, Silver, or Bronze Stevie Award, as determined by professionals in the ABAs’ peer-review judging, and a crystal People's Choice Stevie Award, as determined by the public vote. Winners of the crystal People's Choice Stevie Awards will be announced at The American Business Awards' new product and tech awards banquet at the Julia Morgan Ballroom in San Francisco on September 16. Past winners of the People’s Choice Stevie Awards for Favorite New Products include Apple, Boost Mobile, Dow Jones, and Samsung. August 9 is the last day to vote in the 5th edition of the People's Choice Stevie® Awards for Favorite New Products, as part of The American Business Awards, the nation’s premier business awards program. *Statements and decisions by Judges are not made on behalf of their company and do not reflect any representations or endorsements by their company.